Few months back, we reported a serious security vulnerability in the popular gaming app called QuizUp by Plain Vanilla Games. Plain Vanilla Games is a hugely funded company, with QuizUp being its flagship product so far. According to Wikipedia, the company has 20 million users, and has raised $27.7 million in funding, with over a billion matches being played every single day. While playing QuizUp, we found it tough to score a perfect 160 in every match. But we wanted to win. And when you want something real bad, you find ways to achieve it. Traffic Analysis of the network data and figuring out possible security issues in it. We decided to go with Traffic Analysis as a starting point to figure out the security issues. Intercepting network traffic in iOS is the easiest thing possible in the universe, according to me. You just need to go to **Settings | Wi-Fi | HTTP Proxy **and enter local IP of your system on the network in the proxy IP field. On your system, you can use any proxy tool you feel comfortable with – Burp Suite, Charles Proxy, MITMProxy etc. We decided to go with MITMProxy as it gives you a much more hackerish feel while using the tool. Oh yeah, it does support additional Python scripts (which we love to write to automate almost anything). You can also check out the Github repo or the official website. or you could chose to build from the source, whichever you prefer. You could even download the binary package if you’re on Mountain Lion. Coming back to the QuizUp vulnerability, we set up the proxy on the device and the system, but there we have another issue. You can’t intercept network traffic as usual, due to the implementation of SSL Pinning. Many developers assume that simply using HTTPS is the most secure thing to do with an application. For these connections, you could simply add your own certificate (or the certificate by the proxy tool) to the device’s trusted store, and sniff it as the usual HTTP traffic. Few app developers go ahead and implement SSL Pinning, which validates the certificate being used, and if it matches the original certificate specified by the developer. So here, the usual way of HTTPS traffic interception won’t work. One of the ways to bypass SSL Pinning is to hook into the method which validates the trustiness of the certificate and make it return true always (or false depending on the scenario). 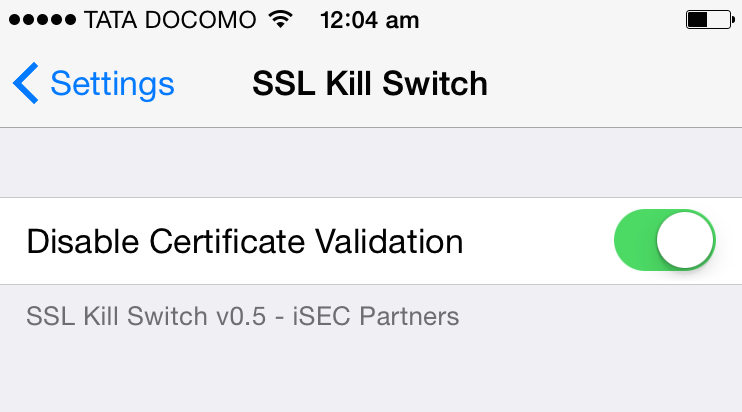 For iOS, if you don’t want to hook into the methods manually and patch the boolean return value, you can use the tool – SSL Kill Switch by iSec Partners. Download the debian package from here. SCP the sslkillswitch deb file to your idevice. 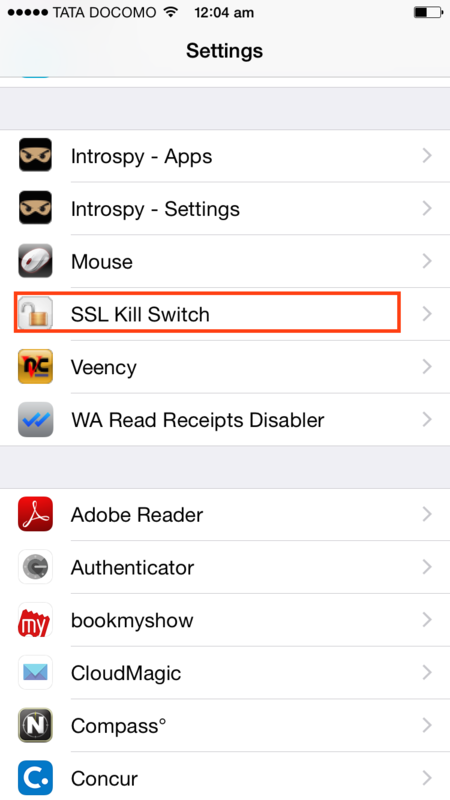 after which you’ll be able to see the SSL Kill Switch option in your Settings menu of your iDevice as shown below. Once you’ve bypassed SSL Pinning and are able to sniff the traffic in your proxy tool, you now need to look at all the packets and think for possible security issues. It took us around half an hour to figure out the vulnerability here, as discussed below. When you accept a new challenge on the QuizUp app on your device, as soon as the challenge starts, it receives the response containing the full solution to the entire challenge as a JSON dump. That’s it. But that wouldn’t be that fun, without writing a python script. So, we wrote the Python script for MITMProxy parsing the json, and displaying the correct answers. def response(context, flow): res = flow.response; try: if res.content: print("Response Content: -----------------"); print "\n\n\n\n" try: j = res.get_decoded_content() find_answer(j) except Exception, e: print("NO JSON") print("END CONTENT----------------") except Exception as ee: print(str(ee)); def find_answer(json_string): json_obj = simplejson.loads(json_string) questions = json_obj["game"]["questions"] for question in questions: answers = question["answers"] for answer in answers: if answer["correct"]==True: print "\n\n##############################################" print "answer is "+answer["text"] print "##############################################\n\n"
Now, you need to start MITMProxy with the -s flag specifying the script and -p for the port number. All the vulnerabilities were responsibly disclosed to the QuizUp team, to which they responded immediately and fixed it in the next release of the app. If you’re interested in more similar kind of mobile security stuff, or would like to find vulnerabilities in mobile apps or secure your own apps, attend one of our trainings or organize one at your organisation.